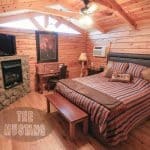 We have 6 cabins, each with 2 rooms and 2 bathrooms, each room is perfect for 1 or 2 guests. Every room has a different name, theme and furnishings. 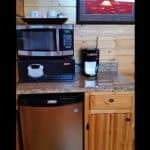 Every room on the left has a king-sized bed and every room on the right has 2 double beds with luxurious bedding, gas fireplace, cable TV, AC, small refrigerator, microwave, safe and Keurig coffee maker. 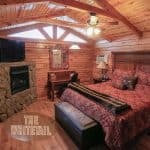 Each room has a private tiled bathroom with heated floors, 3 shower heads and furnished with soft white towels. Enjoy wildlife out your door and fly overhead while watching the beautiful sunsets all within walking distance from our lodge on Lake Oahe where you can enjoy a home cooked meal and refreshments at the bar. 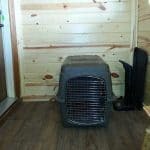 Your dogs may stay in their crates in your heated mudroom. Please dispose of their waste properly. 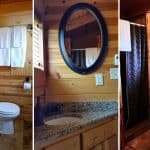 The rooms in Cabins 1 & 2 share a deck but have separate mudrooms for more privacy. 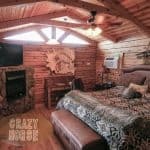 The rooms in Cabins 3-6 share the deck and mudrooms, perfect for groups that want to be nearer. 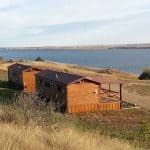 All cabins overlook Lake Oahe part of the Missouri River. Cabins 5 & 6 (called Bridgeview cabins) just a walk behind the cabins allow for a beautiful view of the Forest City Bridge celebrating its 60th anniversary.